Slovakia has abolished its flat tax rate, but other Eastern and Central European countries are likely to continue with the policy. Slovakia has maintained a flat tax rate for nearly nine years. Originally introduced with the aim of stimulating investment and to show the world it had moved on from its former communist economy, it has now been abolished by the country’s newly re-elected government. Andreas Peichl analyses the effects of the flat tax since 2004, and what the results of the government’s move to a more progressive tax system might be. He also concludes that, despite the lack of data on its effectiveness, the remaining countries in Europe that still use a flat tax are unlikely to abolish it. In May 2004, Slovakia was the first Central European country to introduce a flat tax and was considered as one of the role-models for the movement towards lower, flatter tax structures. However, in January 2013, Slovakia’s newly re-elected left-wing government (which had previously left the flat tax regime unchanged) re-introduced a directly progressive income tax (PIT) as part of an austerity package. In addition to the original flat tax rate of 19 per cent, the PIT now has a second bracket of 25 per cent for incomes above a multiple of 176.8 of an applicable subsistence minimum (currently amounting to approximately €34,400). In addition, the corporate tax rate was increased to 23 per cent. This drew criticism from the opposition who fear a reduction in investment. Slovakia introduced its flat tax at the same time as joining the EU in 2004, with the aim of attracting foreign direct investment in order to boost the former communist state’s economy. From its introduction, the policy seemed to work: the economy grew at rates of up to 10 per cent, unemployment decreased from 20 to 10 per cent, and government debt decreased from 50 to 21 per cent of GDP in 2008. So why has Slovakia abolished its flat tax and what are the likely consequences? Let us start by looking at the history of the flat tax idea. By introducing the flat tax in 2004, Slovakia followed the example of the Baltic States and Russia. It was the first Central European country to do so and many others followed. This flat tax movement, however, was not a new development in history. In fact, until the first half of the 19th century, flat taxes were common throughout the world. Progressive tax schedules were first called for by Marx and Engels in their “Communist Manifesto” (1848) and have since been adopted by most countries. In the 20th century, flat rate income taxes only existed in tax havens like Hong Kong or the Channel Islands. However, since the collapse of the Soviet Union, the flat tax idea (sparked by the academic contributions of Hall and Rabushka) has been remarkably successful, especially in former Communist countries in Eastern Europe. Since its introduction in Estonia in 1994, several countries followed suit, including Russia (2001), Slovakia (2004), Georgia and Romania (2005), Macedonia and Albania (2007), the Czech Republic and Bulgaria (2008), Bosnia (2009) and Hungary (2011). Why did the flat tax idea not spread to Western Europe and why is Slovakia the first country to abolish the flat tax by re-introducing a progressive system? One reason for the success of flat taxes in transition countries in Eastern Europe was the use of the low marginal tax rate by new governments as a signal for a regime shift towards more market-oriented policies. Furthermore, in most countries, the introduction of the flat tax system was accompanied by additional reforms of, for example, the tax base, social insurance contributions, benefits, indirect taxation and tax administration. In countries where such a signal or such reforms were not necessary (Western Europe), the flat tax idea had less appeal. The key arguments against a flat tax are distributional effects at the expense of the middle class. These might question the long-run sustainability of flat tax systems: “It is possible to have a flat tax, or to have democracy, but not both” (p. 92). In addition, the recent crisis has led to demands that the rich should pay their ‘fair share’ of the burden. 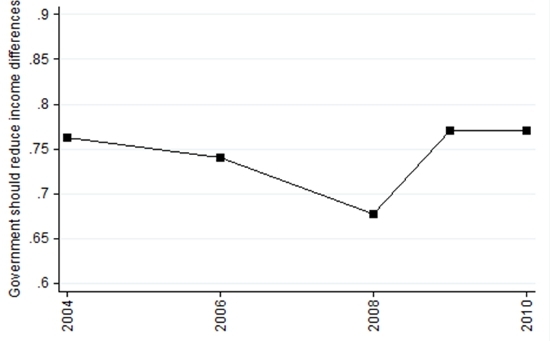 This can also be seen from Figure 1, which shows the large increase from 2008 to 2009 in the share of respondents who answered positively to the question of whether the government should reduce income differences in Slovakia. What can be expected from Slovakia’s move back to a progressive system? While the flat tax reform was expected to boost the economy, no causal empirical evidence apart from revenue-neutrality has been reported. In general, clean empirical evidence of the effects of introducing a flat tax is scarce for two reasons. First, many things changed at the same time (entry into the EU, low labour costs, tax reform, etc.). Second, usually no or little high-quality (micro) data is available for the pre-reform period. Yet, in the period after 2004, Slovakia has seen strong growth and falling unemployment, and it is still the fastest growing country in the EU. Will this change? The higher progressiveness of the PIT should not have a large effect as the top marginal rate of 25 per cent is still rather low compared to other European countries, and estimates for the elasticity of taxable income are usually small as well. The increase of the corporate tax rate might be more problematic in the short run as it might discourage foreign direct investment. If this occurs, then firms leaving the country might lead to increasing unemployment and lower tax revenues. Will other countries follow Slovakia’s example? At least in Bulgaria, abolishing the flat tax has been extensively discussed. However, the finance minister has recently abandoned such plans by arguing that the country needs the flat tax at least for the next ten years to help the country catch up with other EU member states. Thus, it seems that the flat tax still has some life left in Europe, even if one of its key role models has abandoned it. Andreas Peichl is Senior Research Associate and Deputy Program Director “Future of Labor” at the Institute for the Study of Labor (IZA) in Bonn, Germany. He is also Research Associate at the Institute for Social and Economic Research (ISER), University of Essex, UK and Research Affiliate at Center for Economic Studies (CESifo) of the University of Munich, Germany. His current research interests include public economics, applied micro-econometrics and labour and welfare economics with particular reference to tax reforms and their empirical evaluation, tax benefit microsimulation, the analysis of income distribution and especially the measurement of richness at the top of the distribution. Slovakia, Czech Republic or Poland are Central European countries and not Eastern European. Russia, Belarus and Ukraine are Eastern European countries.